Welcome to the Cleeve Collectables shop. Cleeve Collectables is owned and run by Steve and Carole Dyer, working from our home in Seend Cleeve, Wiltshire. We trade regularly at a number of antiques and collectors' fairs, selling a wide variety of items including ceramics, glass, treen, militaria, pictures, toys and games, books, ephemera and collectables. We will be listing items from our extensive stock regularly so please check back regularly or subscribe to our shop for regular updates. 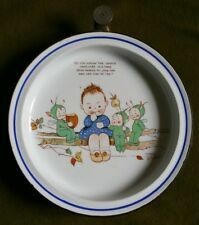 A Mabel Lucie Attwell Boo Boo Warming Plate Do You Know The Laddie...? Original Pen and Watercolour, "Midday Snooze"
1930s Coloured Nursery Print "Hey Diddle Diddle"